Immediately after a traumatic motorcycle accident, you’re probably confused and scared. If you were knocked unconscious in the crash, you may not even remember hitting your head. There’s a good chance that your motorcycle is totaled or needs significant work. If you are the loved one of someone who’s been in a wreck, you may be wondering what you can do to support your injured family member or friend. If you’ve been seriously injured, you are likely facing a long road to recovery and mounting medical bills. Hiring an experienced motorcycle accident attorney is imperative if you hope to receive the most compensation possible. A qualified personal injury attorney will conduct a thorough investigation of the accident. The attorney’s goal is to gather the information and present it in a way that proves you were wrong, ideally through no fault of your own, and get the highest possible settlement from the at-fault party’s insurance company. From a legal standpoint, medical records are vital evidence in a personal injury case. Often, a motorcycle accident attorney cannot provide any legal help unless the injured person gets medical treatment. In addition to those medical records, collecting evidence from the scene of the accident is extremely important. Figuring out that the other party was completely, or at least partially, at fault is a crucial part of your personal injury claim. If you don’t have solid evidence, even veteran attorneys will have a tough time proving the other party was at fault. Your attorney may also hire experts to prove your case. Motorcycle accident attorneys will often bring in crash reconstruction experts, forensic experts, a vocational expert (an expert in work) or an economist to paint a complete picture and calculate the extent of your damages. After calling 911 and making sure your life is not in danger, there’s a few key things you can do after your motorcycle accident. If you can stay on the scene after an accident, collecting information from the driver who hit you and any nearby witnesses may save you a lot of trouble later. Even if you were involved in a single-vehicle crash because of a poorly marked construction site or metal plate in the road, it’s a good idea to collect as much information from police and witnesses as possible as soon as possible. If the driver of the vehicle that hit you stopped, get their name, contact information, and insurance information. If the at-fault car fled the scene, write down everything you remember about it as quickly as possible, and ask any nearby witnesses what they remember. Even if your injuries didn’t seem severe in the moment, it’s a good idea to get a checkup as soon as possible. Remember, there’s no such thing as “too much evidence” when it comes to your accident case. No matter the severity of your motorcycle accident, consulting with an experienced attorney can be beneficial to victims who are interested in learning about the legal process and whether they have a valid claim. 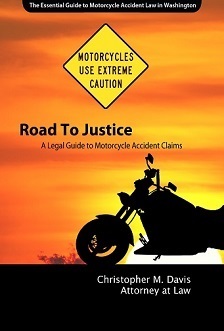 Attorney Chris Davis has been representing motorcycle accident victims for over 20 years. Mr. Davis and the team at Davis Law Group, P.S., are committed to recovering the compensation their clients deserve. Call Davis Law Group at (206) 727-4000, use the chat feature below or fill out the contact form on this page for a free case evaluation.